The Urbz: Sims in the City is the next game of the Sims franchise on the consoles. After the Sims Get a Life, and the Sims Bustin' Out, Sims are now hitting the city in a city that's alive 24/7. There have been many screenshots and movies already, and the official site is updated weekly with a blog about the development and more. Alex Hutchinson, lead designer at Maxis of the console version, showed the PS2 version to members of the press in the Netherlands and Belgium, including me. When you first start the game, you'll have to create your own Urb. You can have up to 4 different urbz in one game, but you control just one at a time. While playing with one of them, the others will appear as NPCs in the district you left them. You can choose some basic traits of your Sim, but that's of course far from everything. If you think the create-a-sim mode in Bustin' Out was big compared to the first version, then you'll be amazed at the new possibilities. Besides dressing your urb the way you like it, you can make them look exactly the way you want. Using morphing techniques, you can use several sliders to change the size of certain body parts (for the guys: this includes brests). The face is a bit special, in that you can morph several parts of the face, and not just the face as a whole. This makes your urb very unique. Don't compare the create-a-sim to the Body Shop though, it's much more limited. Still a great improvement since Bustin' Out though, where you could only choose pre-made bodies and faces. Of course you also have to pick some clothes, and these come in different styles for every district. The GameCube version will include extra outfits that are from the GBA version of the game too. Your sim will live in one of 3 apartments at first. You start off low, but as you progress through the game and gain more rep and money, you'll be able to move on to a bigger apartment. You can change and decorate your home in any way. However, you can't change the exterior walls, due to the roofs on them. Also, some objects will only be seen at home and not in the city, for example a shower, so your Urb will have to go home every now and then. There are beds in some districts though, so it's not too bed. When you first enter the apartment it will be empty. There are some things in your inventory, accessed through the XAM (pronounced "zam" which stands for Xchange money and items, Access special areas in the city, and Message your friends to stay connected 24/7). 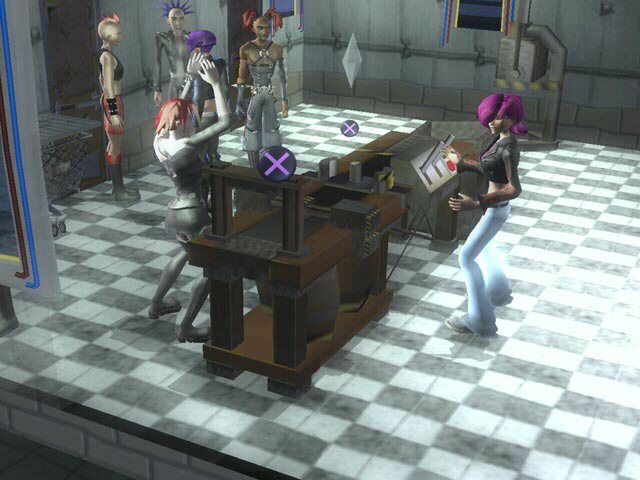 The XAM replaces the menus in previous game. Although you can stay at home, you'll rather start in one of the 9 districts just to get going - even if it's just to earn money to pay the rent. Your urb will not have to feel lonely at home. Even though there are other characters everywhere, you can now also get a pet. There are three types of pets: a dog (bulldog), a cat and a monkey (not the one that can kill you bytheway). These pets can be unlocked by furnishing your apartment - every one of them has one pet to be unlocked. While playing you have to take care of your Urb to keep them happy. There are just 5 motives this time though, which are bladder, hygiene, hunger, fun and energy. They are at the bottom of the screen all the time, with a sort of smiley face on the left of it. That replaces the old mood bar, and reflects the happiness of your urb. The happier it looks, the better. The game is balanced so that you will spend about one third of the time working on motives. Another third will be spend working, and the rest is left for socialising. Of course you're in control, so it's up to you how it's divided in the end - it's even possible to play and finish the game without working at all, but it'll be a lot harder. Keeping your sim happy should now be less stressfull. When you go to sleep, the screen will go black for a while and when you wake up it'll be normal again - just in a few moments. The rest has been speeded up quite a bit, and should go about twice as fast compared to the previous games. If you still fail to keep your sim happy, or if they die through another reason (10 in total), like being killed by a monkey, nothing is really wrong. Your sim will be revived soon enough, so you won't lose them. Besides the 3 apartments, Urbz live in 9 different districts of the city. Every district has its own unique style, and is a parody on a real-life culture. For example, the Neon East district is derived from the Tokyo culture. The style of a district is expressed in several ways. For example, the buildings have roofs in the style of the district. Unfortunately those set roofs cause one limitation: you can't change the exterior walls. You can of course place windows etc., but that's all. You can still move, change or build interior walls though, which still makes the places somewhat customisable. New is also that while you're in the city, you can change and move things as you wish. If you don't like the way a table is placed, you're free to move it or even get rid of it. The culture is also reflected in the characters, so-called Urbz. Every district has 5 characters, plus there are some general characters that you'll find everywhere. One of them is Darius, you're guide in the city. The characters are parodies on cultural flows, like goths, punks, gangsters, etc. There are also 3 villains around, who hassle other Urbz at specific times. You have to socially humiliate them to stop them. In total there are 65 unique characters, each with a different personality and looks. The urbz in a district are normal Sims though, except that you cannot play them. That means they too can die. So if you don't like the Black Eyed Peas, just pay a visit to Cozmo Street, and kill them. This will probably not help your rep, but it is possible. 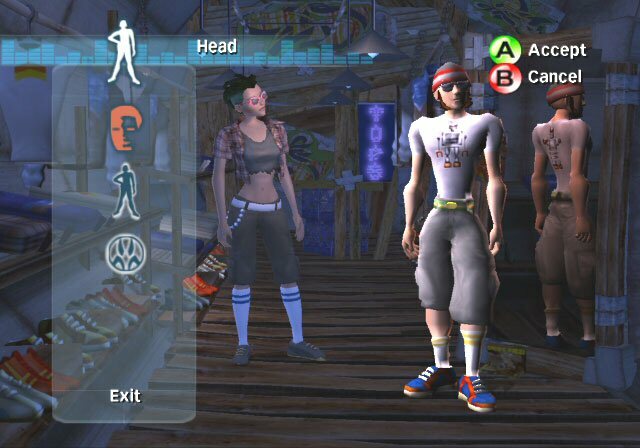 The Black Eyed Peas don't only make their entrance as urbz in the game, they've also recorded 9 tracks for the Urbz. 3 of them are known ones, like "Let's get it Started," 3 come from their new album, and there are 3 unique tracks made for the Urbz. 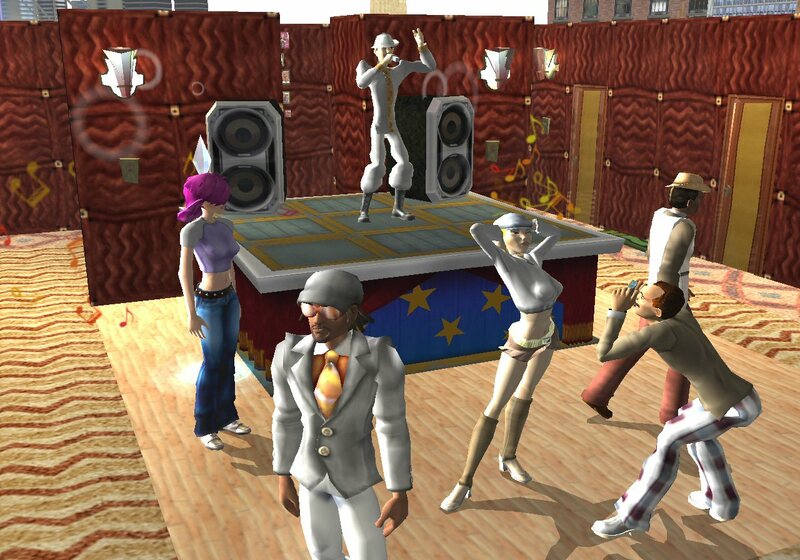 The existing songs have been re-recorded in Simlish, which makes them unique in the end. Every district also has a shop and VIP room. In the shop you can buy new objects, to place at home or in the district. You can also buy new clothes, piercings, jewellery, make-up and even tattoos, so you fit right in the district which you're in. All of these (except clothing) can also be removed if you want to change your sim. You can place piercings etc. on prefixed body parts of your Sim, so you're not completely free. However, it's definitely an improvement since the previous games. There's a bit more freedom in the clothes department. You can make your own shirts by placing different decals on it. No urb has to look the same, and as Alex said, testers end up with entirely different Urbz. There has been a thought of having plastic surgery in the game, but that's never really been made. So once you made your urb at the start of the game, their physics will remain the same throughout the game. The main goal of the game is to gain reputation (rep) with your Sim, and become famous. You can rep by socialising with other urbz all over the place. When you "click" an urb, the socials, and there are 70 in total, are colour-coded. Green actions will improve your relation with that character a lot, yellow options will help a bit but not much, and red actions are more likely to damage rather than to improve the relationship. If you gain some rep by socialising with a sim, the rep-meter will fill up with some stars. Every time it's filled up, you unlock something new, e.g. objects or social moves. Eventually you'll be able to use some power socials, which can improve a relationship a lot in one go. When doing a power social, a meter will float over your head, and you have to press a button the right time to do better. Once you made it in the city, you can start a crew. Of course you'll need other urbz to follow you. The crew will also help you gain influence in the city. By gaining more and more rep, you'll eventually show up on posters etc. in the game. 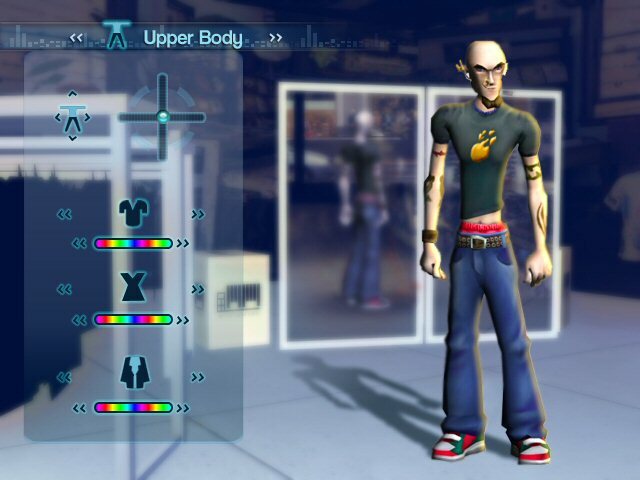 If you have a PlayStation 2 with EyeToy, you can even import a picture using that, and then you'll see your own face instead of that of your urb in the game. Your urb gets advertising contracts, which mean you'll even get some money for the posters. There's also a level of awareness, which means other urbz turn their heads towards yours if you're popular enough. You'll also start to notice that you can become a trendsetter, and others will dress the same style as your urb. In the end, your rep can effect life in the entire city. Another aspect of the game are the jobs. Every district has a different career, practiced on a special object somewhere in the area. You have to press a sequence of 4 buttons repeatedly to improve your job performance. For example, when making drinks, you'll still make drinks when you're not doing very great, but it'll be slower and you'll be making less simoleans. While working, you don't have to take care of your Sim as much, but instead you have to try and get promoted. All careers have 3 promotion levels, so in total there are 27 jobs. Objects that might help you getting promoted are the skill objects. These are also unique for each district, and are wackier than the regular chessboard, bookcase and other objects you know from previous games. There's for instance the "Snizzilator". It's a sort of karaoke machine, and your Urb will have to mimick a robot in singing or dancing. These skill objects also have 3 stages. Skill training is now easier and more fun. Written at 02:11 on Friday 15 October 2004 by ChEeTaH.